Code – A code of up to 10 digits. Description – Description of the shipping method. Method – How to charge the shipping fee. Prompt – User enters the freight on each order manually. Fixed – Shipping fee is a fixed amount. Rate – Percentage of the order. Threshold – Charge freight if the order is less than threshold. Rate – Percentage to charge for freight. Min Charge – The minimum to charge for freight. 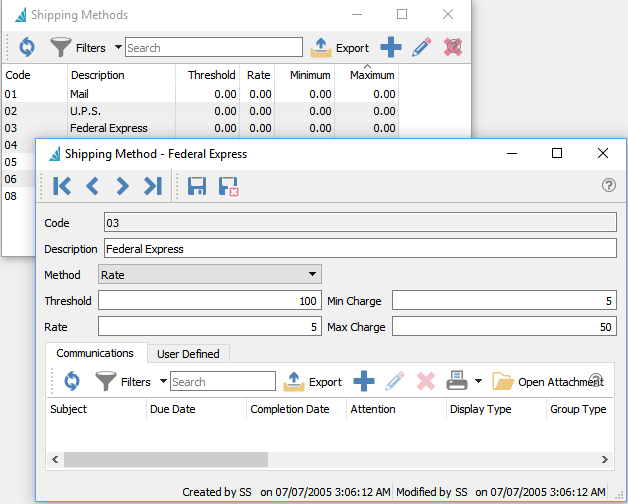 Notes – Any number of notes specific to the selected shipping method.